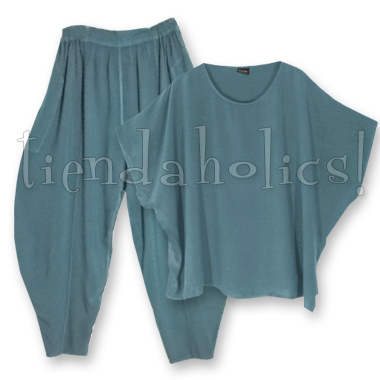 THIS SET, THIS COLOR IN-STOCK NOW! To see more details and measurements for the perfect little NIZUL top, click here. We've matched this adorable top with our most popular harem pants. These are the CASBAH—a style I've customized for petite goddesses whether willowy or rubenesque! More details, including measurements, for the CASBAH style, here. These pieces sell separately for $143... but you can have them now without the wait and SAVE, too!